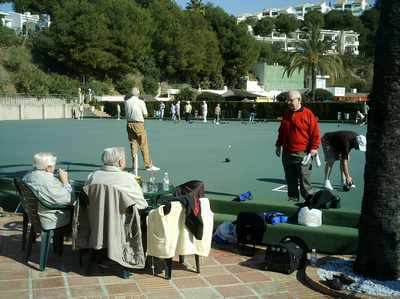 Our Bowls Club nestles in the centre of the scenic Riviera del Sol, Miraflores residential complex, located on the main coastal road 10 mins. from Fuengirola and 15 mins. from Marbella. The club welcomes casual bowlers both playing amongst themselves and also joining in club roll-ups and our fun events such as the annual Charity Day. 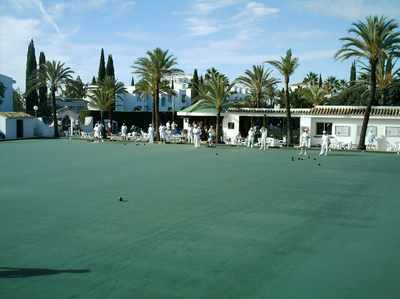 We have many bowlers who return on holiday to enjoy the facilities year after year, and also longer stay visitors and residents who simply want to enjoy a game in beautiful surroundings. Beginners are also welcome and tuition is available to help new bowlers get a good start to making the most of their enjoyment of the sport all they have to do is call in or telephone Carol or Grant to make arrangements. The club house has been extended and seats approximately 30 to lunch if required, although usually our weather is good enough for lunch to be taken outside on the terraces in front of the bar and beside the green (when we have accommodated up to 100 for lunch). 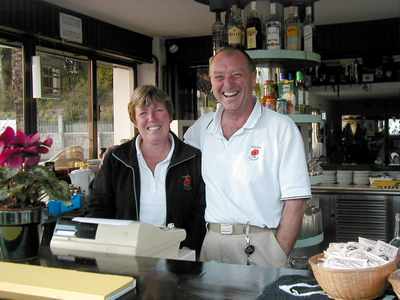 The bar and catering facilities are currently run by Carol & Grant Frost on a franchise basis.